Robert Goddard may be known as the father of US rocketry, but back in the 1880s, he was just a kid in Worcester, Massachusetts. Even as a youngster, his eyes glimmered with scientific interest and the thrill of discovery. With BAMS! POPS! BANGS! he experimented time and time again with one mission: make his rockets fly! 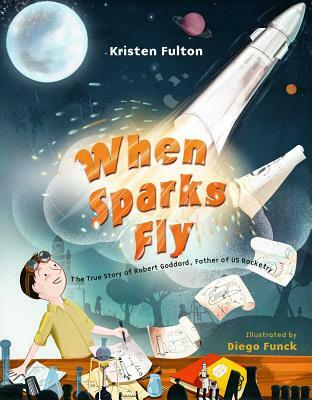 Join Kristen Fulton and Diego Funck as they take you on one explosive journey about a young kid who shot for the moon, never gave up, and let his creative sparks of curiosity burn bright. Diego Funck is an artist living in Brussels, Belgium, where he works as an illustrator and graphic designer for children's books and international publications. He has showed his works in galleries in Argentina, Belgium, and England. Visit him online at Behance.net/DiegoFunck. "An engaging and accessible contribution to the STEM-related biography canon."